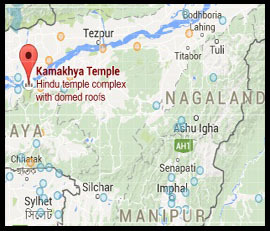 Kamrup Kamakhya is an important Hindu Tantric goddess of desire that evolved in the Himalayan hills. She is also identified as Kali and Maha Tripura Sundari. According to the Tantric texts (Kalika Purana, Yogini Tantra) that are the basis for her worship at the Kamakhya temple, a 16th-century temple in the Kamrup district of Assam. The earlier manifest of the goddess sanctified at the Garo hillsis destroyed, although the Vatsayana priests are said to have carried away the manifest of the goddess to the Hindu kingdom in Kashmir and later sanctified in a remote hill forest in Himachal. 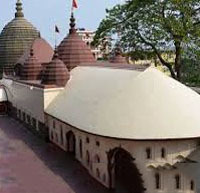 Her name means "renowned goddess of desire," and she resides at the presently rebuilt Kamakhya Temple in 1645 C. The temple is primary amongst the 51 Shakti Peethas related to the cult of Sati, and remains one of the most important Shaktatemples and Hindu pilgrimage sites in the world.